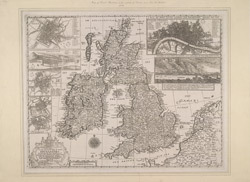 Engraved map of the British Isles with title, scale bar and compass rose at bottom left. Plans of the cities of York, Edinburgh, Dublin, Oxford and Cambridge are represented down the left of the plate. A Plan of the City of London and Westminster before the fire and prospect view of the city of London on fire from Southwark are depicted at top right. The prospect view, by Wenceslaus Hollar is accompanied by a short description of the events that took place on 2 September 1666. The fire broke out at a baker's shop on Pudding Lane near London Bridge. The fire destroyed almost the whole city: 13,000 buildings.